"Evil Jester Presents" is a gorgeously illustrated anthology featuring terrifying tales from some of the biggest names and most exciting talent working in horror today. Full color. 28 pages with no ads. The anthology series features International bestselling and award-winning authors such as Jack Ketchum, Ramsey Campbell, Jonathan Maberry, William F Nolan, Gary Braunbeck, Joe McKinney, Mort Castle, Gene O’Neill, and many more. Before the internet and slasher movies kids who were looking for some horror stories would devour comic book collections like Tales from the Crypt, The Vault of Horror and Eerie. They fell out of favor for a while but are making a resurgence. I suspect the zombie craze of late has helped. What is different this time around is the ability of independent and small presses to publish quickly and affordably utilizing campaigns like Indigo and Kick start. Combined with the option of digital comics; more writers and artists are able to bring their ideas to life. 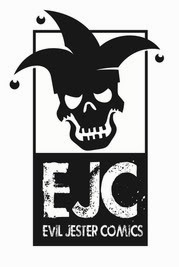 Evil Jester is a new horror collection based on the old school horror comics. Instead of the Crypt Keeper, you get the disturbing Evil Jester. The first issue was funded through indigo. Considering the talent they recruited it is no surprise it was a successful campaign. Evil Jester contains four quality horror short stories by some of the best in the horror genre. The opening page introduces us to The Evil Jester, and does a great job of setting the creepy tone for what follows. 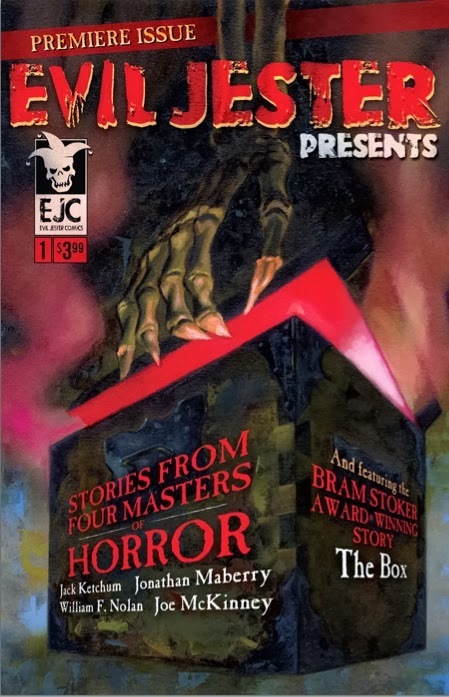 The first is “The Box” by Jack Ketchum, one of the two longer tales. There is no monster in this story, only a box that the reader never sees what’s inside of. We get to see the chilling results of looking into the box. This is more of a psychological horror story as a father slowly watches his family die of despair and he can’t do anything about it. “Swallowed” by Joe McKinney is a quick read at 5 pages. We get an unusual POV of the end of the world. 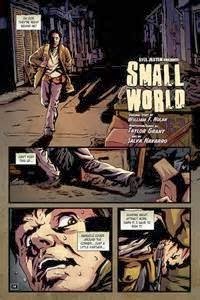 “Small World” by William F. Nolan is the second shorter story. A man fights to survive after an apocalypse. The story alternates between him running from a threat the readers can’t see and his life before the invasion. The readers will surprised to see what the man is running from. “Like Part of the Family” by Jonathan Maberry is the other longer story. This was my favorite because it is a dark urban fantasy like the novels I prefer to read. A hard boiled private eye has a case that ends him up in a room full of vampires, which he didn’t know existed. But that’s okay because he has a secret of his own. All the stories are top notch and so is the writing. The only problem I had was with the digital coloring look of the artwork. I think that style fit the last story “Like A Part of the Family” but not the other three. But that is just my personal tastes. Overall this is a great debut and I am looking forward to many more. EVIL JESTER PRESS is a successful publisher of award-winning horror novels. But many of our fans have talked about their love of the comic medium and the lack of quality horror comics being published today.